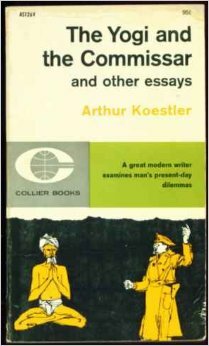 In his 1942 essay, “The Yogi and the Commissar,” Arthur Koestler outlined two extreme responses to the exigencies of communal life. One was the belief that social improvement could only occur through collective activity to alter the ownership of the means of production. The other was the belief that change could only occur through individual spiritual transformation. Each generation has seen these twinned Hegelian opposites reappear in new guises, viz., the beatniks and young Trotskyites of the 1950s, or the Hippies and Yippies of the 1960s. Today, this same polarization is re-emerging in response to the introduction of the Dharma to the West. Some see both Buddhism and secularized mindfulness as, for better or worse, a field of individual spiritual transformation, while others critique both Buddhism and mindfulness for insufficient social engagement. If one listens carefully, one can almost hear echoes of the original Mahayana critique of so-called “Hinayana” Buddhism for its alleged exclusive concern for individual liberation. It is Western Buddhism’s peculiar provenance that its early practitioners were drawn largely from politically liberal social strata: beatniks, hippies, peace corp volunteers, psychedelic enthusiasts, and disaffected intellectuals — I count myself among them — people who were alienated from the dominant culture’s emphasis on consumerism and conformity, its empty professions of piety, its worship of celebrity and success, its aggressive evangelization of American Exceptionalism, its insufficiently explored dark history of African slavery and native American genocide, and its profound unease with socially marginalized groups and unwillingness to share its largess with them. It’s therefore not at all surprising that American Dharma has become an ideological battleground between those wishing to keep it arms length from politics, and those who take the Bodhisattva ideal as a mandate for political activism. Politically active Buddhists almost always continue to pursue their pre-Buddhist Leftist predilections under the Buddhist flag, providing, in some ways, a mirror image to Fundamentalist and Evangelical Christianity’s embrace of right-wing policies. This debate over Dharma and politics has emerged with renewed energy as mindfulness practices have made their way into corporate America and the military, and the rhetoric of mindfulness has been adopted by wealthy elites. The Left, reflexively suspicious of business, the military, and the rich, is concerned that mindfulness’s emphases on equanimity, acceptance and non-grasping may make it a tool for pacifying disadvantaged classes, encouraging them not to stand up and fight for what is rightfully theirs. It worries that secular mindfulness, divorced from a larger ethical frame, may help soldiers become better killers. It worries that, accommodating to the American gospel of success, it may become just another vehicle for promoting professional and material advancement. It worries about a Dharma that “professionalizes” and becomes another way to “earn a living.” It worries about a Dharma becoming just another brick in the capitalist superstructure. In dialectical debates of this kind, truth never abides in one corner. Every voice must be attended to, and hopefully people are not speaking past each other. In fact, one hopes for dialogue rather than debate. That’s the best away to struggle towards a new synthesis. That having been said, I have my own particular point of view as someone who is deeply interested in the future of both Buddhism and of secular mindfulness, but who is neither reflexively anti-business nor anti-military. My general point of view is politically liberal, but not politically radical. I don’t belong to a marginalized or disadvantaged social group, although I am sympathetic to their claims. My family has historically benefited from the American experience. My father’s family emigrated to America from Romania in the first decade of the twentieth century to escape the rise of Romanian proto-fascism. My father’s father was a simple cobbler who died in a work-related accident. My father never graduated from high school. He enrolled in the army before the onset of the second world war and trained as a flight navigator in the 8th air force. When his plane was shot down over the North Sea, he endured fourteen months in a Nazi POW camp. After the war, he went to work driving a truck and then working in a small factory making vertical window blinds. With a loan from a more successful brother, he eventually bought the blind factory, working long hours personally involved in sales, manufacturing, installation and repair for his product. My mother worked too, supplementing his income as a secretary in the New York City school system. My parents never owned their own home until they retired and used the proceeds from the sale of the business to help finance a small condo in Florida. My mother passed away that year and never got to enjoy it. My father didn’t cheat or exploit people in his business. He made a superior product that people wanted and sold it at a fair price. He was good towards his employees. When one of his employees occasionally wound up in jail after a particularly rough night on the town, he was the one who showed up to bail him out. My parents made it possible for my sister and I go to college and further ourselves. The American dream has been good for us, but I understand it has not been good for everyone. I also understand that there is some element to my own family’s success that may have been purchased at the expense of other people’s misfortune. The New York State Scholarship, the National Defense Education Loan, and subsidized state university education that enabled me to go to college were not available to everyone, and the monies spent on them might have helped someone else eat or get medical attention. The large corporations like the Chase Manhattan Bank and Union Carbide that bought my father’s vertical blinds for their international headquarters and helped put food on our table were not entirely benign enterprises. Just one look at the Bhopal tragedy attests to that. I get that. I only recite my background so that you can understand both my appreciation for and my ambivalence about the American experience. I’ve also been someone who’s been politically active for liberal causes my entire life. As a high school student I was involved in the movement to desegregate the New York City public schools, and as a college student, I organized the first demonstration against the Vietnam War in my college town of Binghamton, NY. As an adult, I’ve demonstrated against the Iraq War and for changes in environmental policy. I helped organize a chapter of the Buddhist Peace Fellowship, am an active supporter of Buddhist Global Relief, assist in my sangha’s soup kitchen, and helped write my town’s climate action plan. I say all this to clarify my politics — I’m an old fashioned, unapologetic, dyed-in-the-wool liberal — the kind Marxists deride as being hopelessly petit-bourgeois. Having clarified where I’m coming from, allow me to move on to what I regard as several key points in the debate about the politics of mindfulness. First, Buddhism, on its own, does not possess a social theory, anymore than it has a macroeconomic theory or a theory of particle physics. While Buddhism is anti-greed and anti-hatred, it does not prescribe any specific remedies for social inequity or injustice. While the Bodhisattva ideal requires us to hear the cries of the suffering and not turn away, it does not supply a social recipe for how to go about ending that suffering. While the Buddha taught non-killing, he did not advise kings to abolish armies. While the Buddha accepted women and members of all castes into his sangha, he did not advocate for the ending of the caste system. In saying this, I am not saying we should emulate the Buddha in this regard. I am only pointing out the historic disconnect between Buddhism and social theory. We can invent something new, a twenty-first century Buddhist social theory, but we cannot tell from historic Buddhism itself what the specific content of that social theory ought to be. It will have to be something altogether new. 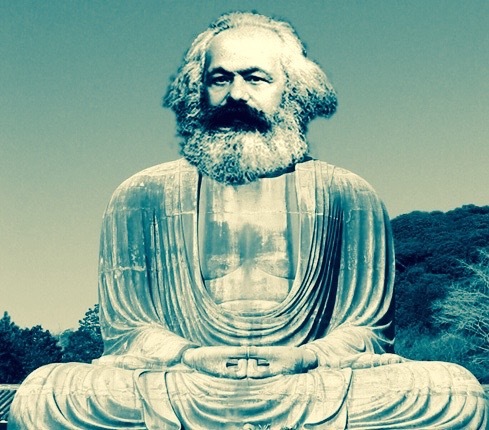 Second, there is no reason why a new Buddhist social theory needs be dogmatically anti-Capitalist. I can imagine it being neutral about capitalist economic organization, per se. While the Buddha eschewed personal ownership of more than a robe, a begging bowl, and a razor, he never advised kings to divest themselves of their treasuries. Some people think that global poverty will only end when capitalism ends, but it’s possible to make the case that capitalism has lifted more people out of poverty than any other form of economic organization. Socialism in its various forms failed China, India, North Korea and the Soviet Union, doing little to end poverty and alleviate human misery — in fact, in many ways only tragically adding to the level of human misery though terror, collectivization, famine, slaughter, cultural revolution, and the Gulag. Some may argue that these governments were not really socialist, and that one cannot judge socialism by their successes and failures, but then it is up to critics of capitalism to provide a counter-example, any example, of a non-capitalist society that has significantly ameliorated poverty within its borders, and even more so, has done so without endless accompanying terror and oppression. China and India are only now making great strides at lifting their masses out of poverty after having adopting capitalist methods. It’s true that the mixed-economy social democracies of Western Europe have been successful at both producing wealth and limiting the growth of income inequality — better in many ways than our more gung-ho, free-enterprise, individualistic United States. Here in the U.S. there are arguments to be made for finding a better mix of planning/redistribution and the free market. There are reasons to think that adjusting taxation formulae, reinvesting in infrastructure development, providing universal day care and pre-kindergarten schooling, improving models of and access to lifetime education, providing for adequate nutrition and universal health care, and reforming the justice and prison systems will help to reduce the current level of income inequality. But this is only an expansion of the ends and goals of the old-style welfare state, not a revolution. On the other hand, there is zero evidence that radically unwinding capitalism itself — whatever that means — would lead to human betterment. Capitalism is far from heaven on Earth, but we could do a lot worse. There are some who argue that corporations, by their very nature, despoil the environment and exploit workers and third-world countries in their endless pursuit of shareholders’s interests. One can point to innumerable disturbing examples of this, but there’s nothing inevitable about it. The problem with corporations is that they’re insufficiently constrained by both law and a countervailing moral ethos. There’s no broad social consensus about how much profit is justifiable and how much is obscene. There’s no extant social ethos compelling corporations to acknowledge their stakeholders and not just their shareholders. Corporations can be morally constrained by the larger culture they exist within, but that kind of transformation is primarily an ethical and spiritual matter, and not an economic one. Socially important transformations of consciousness occur all the time — witness the changing world cultural consensus on matters like slavery and women’s suffrage over the past two centuries, or the rapidly changing consensus on gay marriage. Marxists believe these changes are always economically determined by changing economic relations. While economics undoubtedly plays an important role in determining consciousness, reality is always a two-way street, with ethics and economics mutually informing each other. We require a moral, social, economic, and political co-evolution — and moral evolution is something Buddhism has a great deal to say about. In recent weeks I’ve had the pleasure of teaching a secularized version of the Dharma to employees of a large corporation. I accept no money for this service, since it’s my belief that the Dharma should always be offered freely. I also do not approve of the product this particular corporation is most famous for. I do, however, appreciate the employees who come to learn what I have to offer. They are neither evil minions nor exploited workers. They are people bedeviled by the normal existential issues of life and death, grief and loss, pain and illness, guilt and shame, success and failure that we all struggle with. These are exigencies that owe little to capitalism, per se. They are the same everywhere. The Buddha, after all, taught that life is suffering, not that capitalism is suffering. I’m happy to pass on what limited tools I can to make a difference in their suffering. It’s heartening when something “clicks” and a member of the group “gets” what mindfulness is about — not adding to suffering through cognitive elaboration, touching the vital ebb and flow of life itself, becoming fully present, non-grasping and letting be, and finding all mental states ultimately workable. I have no idea whether or not this will make them better “employees” or further their company’s “mission.” I am unconcerned with that, and they’re there for their own myriad personal reasons. They come on their own free time and of their own free will. It’s not a obligation placed on them by the corporation. I’m concerned that they have the opportunity to improve their emotional intelligence and find ways to more fully embrace their humanity. If I wanted to change their corporation’s policies, I would write a letter to its president, or vote for change at a shareholder’s meeting, or organize a boycott of their products. Teaching the Dharma is an entirely different endeavor, and one that I believe transcends politics. In recent months I read concerns about aspects of the Dharma being appropriated by economic elites. I’ve read criticisms of the Dalai Lama for speaking at the American Enterprise Institute, or Jon Kabat-Zinn for speaking at the World Economic Forum at Davos. Some people react as if this is a kind of betrayal, as if the Dharma was solely the possession of the dispossessed. This, in fact, has always been the way the Dharma has percolated through societies. The Buddha advised kings and Brahmans. It was King Ashoka who spread the Dharma throughout India. In China and Japan, Buddhism was adopted by elites before it disseminated throughout the broader culture. Seminal figures like the Buddha, Nagarjuna, Shantideva, and Dogen were members of their respective aristocratic classes by birth, and often taught and advised other members of their class. Billionaires need help with the existential difficulties of life every bit as much as you or I. You may not believe this, but they do. The very rich, while more cognitively satisfied with their lives’s achievements, are not any happier on a day to day, moment to moment basis than you or I. The Dharma is for them too, just as the Buddha taught that even the gods needed the Dharma. Will their exposure to Buddhist ideas make them more socially responsible? That’s a lot to ask from a brief encounter with the Dharma. Years of deep and committed practice would probably be transformative, but not a mere dabbling acquaintanceship. On the other hand, for some CEOs, mindfulness can serve as a gateway to serious practice. It may be easier for a camel to pass through the eye of a needle than for a rich man to enter into the kingdom of heaven, but wealth is not of necessity a barrier to enlightenment. And then there are always individual cases like the Aetna CEO who learned meditation to deal with his chromic pain and wound up raising the salaries of his lowest paid employees. Lastly, let me briefly turn to the issue of mindfulness in the military. Mindfulness has been introduced to the military as a means of preventing the degradation of attention caused by stress, and perhaps preventing or reducing the post-combat sequelae of PTSD, alcoholism, and suicide. These are all desirable outcomes. No one wants soldiers, armed to the teeth, making thoughtless decisions in the midst of heated emotion and diminished attentional clarity. No one wants young men who only wanted to be of service to their country or to escape the jobless poverty of their communities to suffer the life-long consequences of intense stress — burdens they then impose on their families and on the communities they return to. None of this training is designed to disengage soldiers from their consciences and turn them into more efficient killing machines. The question of whether recent military deployments have been either moral or wise were questions addressed, well or poorly, by men in Washington, DC, and not in the field. The Dharma belongs everywhere, in the boardroom and in the foxhole, and not just in the zendo. None of this is meant to be summarily dismissive of critic’s concerns. We need to do more to make our sanghas inclusive and welcoming to marginalized communities. We need to attend to the ethical issues involved as secularized versions of the Dharma move into the hospital, the workplace and the military. We need to keep the flame of Dharma transmitted to us by our Asian teachers fully lit, and in constant dialogue with its secularized cousins, as we make slow and careful adaptations to the needs of twenty-first century Westerners. We need to think through what a socially engaged Buddhism looks like as we try to develop Buddhist social theory. Let’s be thoughtful about the process, and let’s not turn this into an us against them enterprise, whoever “they” may be. Businessmen, the wealthy, and soldiers are not our enemy. Greed, hatred, and delusion are. And let’s not saddle our new Western Buddhism with outmoded Nineteenth Century political and economic dichotomies that do no real service to the complexities of modern life and offer no real assistance to those most in need. The whole point of karma is to recognize how our actions determine our future, so that we can begin to act properly. It’s not a cosmological or philosophical matter. It’s entirely practical. The main point is not to get in trouble again.